Please visit this page to see what I put my reasons for WordPress Themes need not be GPL licensed. Let me know your thoughts. A New version of AquaFluid is released for WordPress 2.7 ! We updated the Intense theme to have the Tags feature when used with WordPress 2.3. You can go and grab it now ! Mountain Theme is at version 2.0 now. 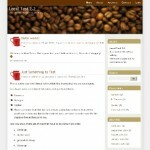 We took our time to update this beautiful WordPress Theme to have the support for Tags, when used with WordPress 2.3. We also made some minor style improvements. Enjoy ! I really liked the Pluralism theme. I took the theme and modified it to fit one of my other websites. And now I decided to release my version of the theme for all of you. “Plural Plus“- is a two-column, Fixed-Width WordPress Theme with many features that you can expect from us.